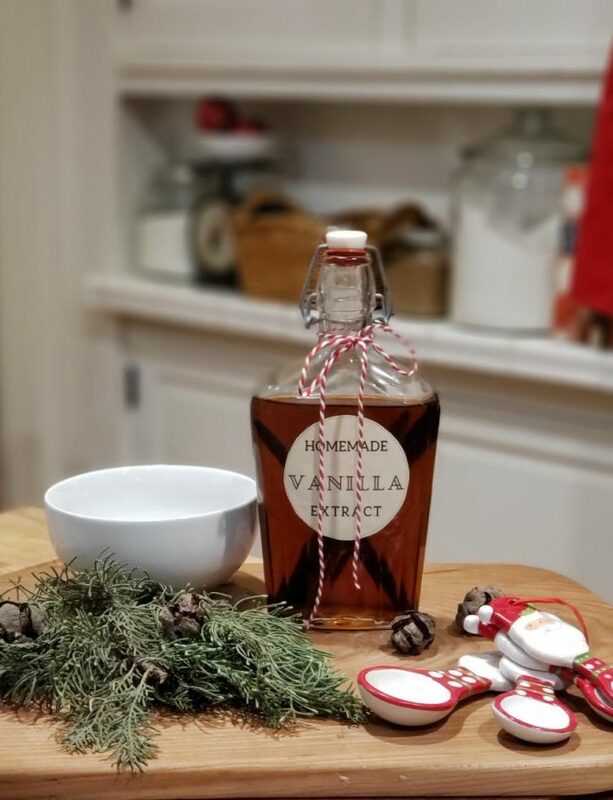 Did you ever feel like you’re enjoying fall so much and looking forward to Thanksgiving Day like crazy, cause you know it’s almost over, and then Winter will begin, and then it’s Christmas season for sure?! Yeah, that’s me. 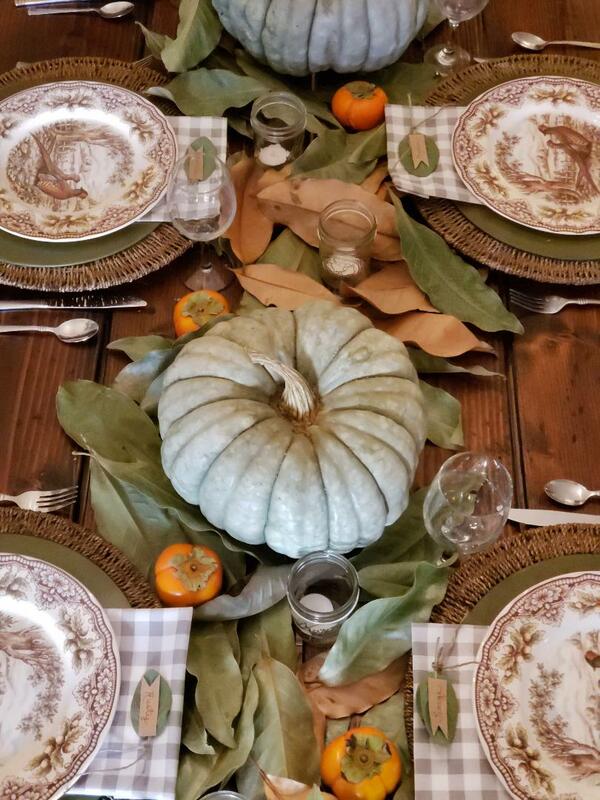 I’ve just been savoring this fall holiday of gratitude that’s coming up here and boy have I been having fun getting creative with my Tablescape! Did you know I’m hosting this lovely no gifts, thank you very much, holiday because it’s all about the Turkey and family? I am. And I love hosting it too! Maybe because it’s a little simpler than Christmas without the gifts and all. It’s mostly just gathering together, catching up, and then the feast. Way too much fun for me! 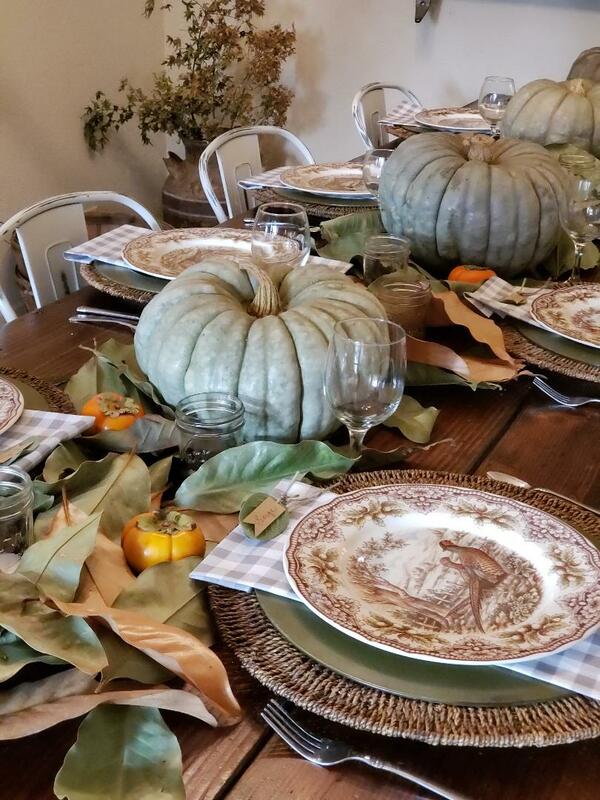 I like to start my planning by choosing a theme to help me focus on how I will set the table. I think that’s a great place to start, and then everything else just falls into place once you’ve decided upon that. Hey, we’ve come along way since the Normon Rockwell Thanksgiving picture from the Saturday Evening Post! I think more than ever, I am very inspired by the rustic charm of the garden and the great outdoors so that’s where I started. First I changed my chalkboard sign to what I’m feeling most and that is for us all to gather. 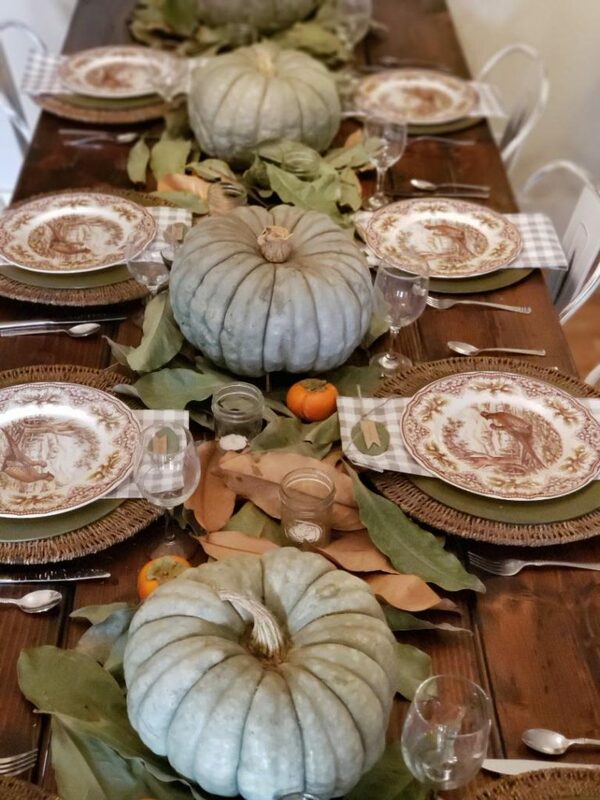 Yes, gather around the table, break bread, and share our communion of the love of our Lord, our family, and the thankfulfulness our hearts feel for the many blessings He has bestowed on us and even for the challenges He’s allowed us to go through so we could lean on Him to grow and get through them. That is the word that speaks to me most right now and sets the stage for the day as our guests arrive. It’s the first thing they’ll see as they enter into our home too. Then I had fun using some magnolia leaves that I’d gathered back in September and brought in side to decorate and make wreaths with. 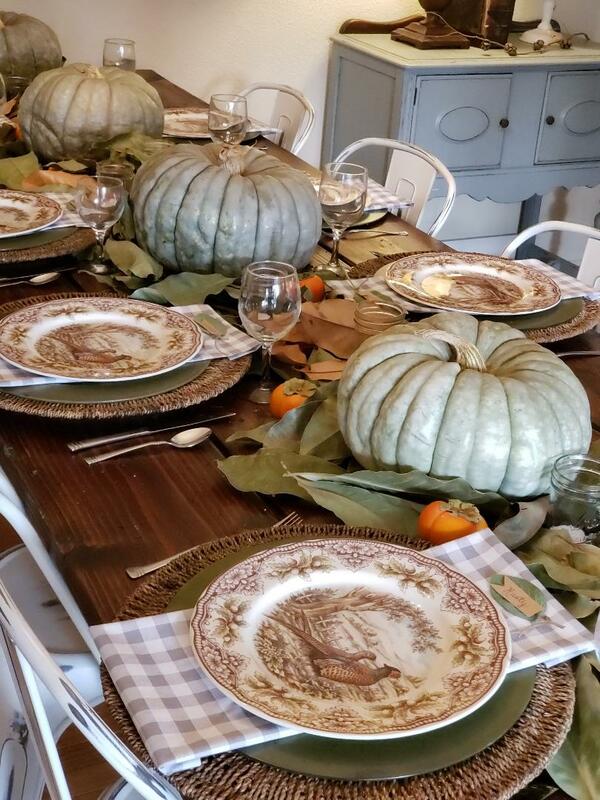 They have faded to a lovely greyish color and along with the tan leaves too, strewn about down the middle of the table is just so pretty to me. 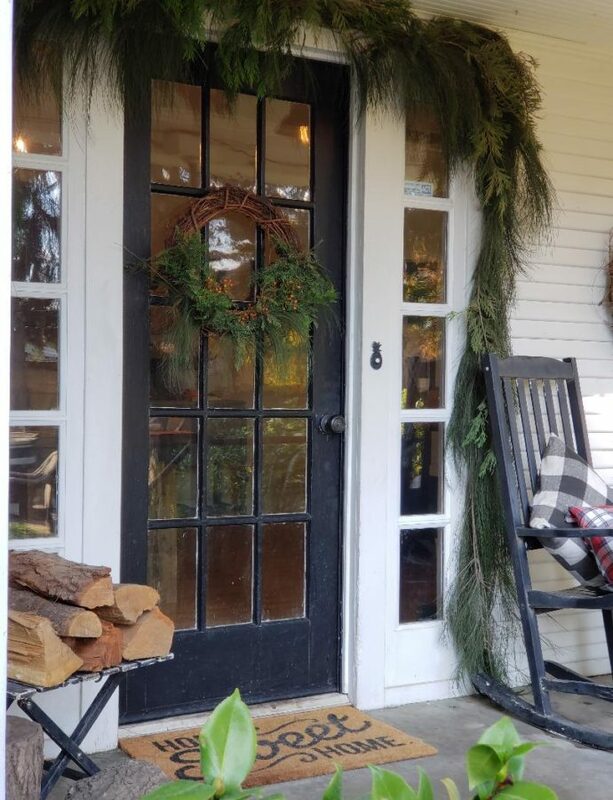 Next I had already collected many grey pumpkins in October for decorating and mostly because I love cooking with these ones the best, so setting them amidst the leaves added to the whole outdoor rustic garden look. Ok, so let me tell you now how excited I am to use these beautiful dishes that my mother just gave me this year. She found them at TJMaxx (the treasure store as I like to call it). She knows that I have this affinity for brown transferware which is a style of dishes and such that uses a technique developed in the mid mid-18th century in England for transfering a print to these beautiful dishes. Every time we go into a thrift or an antique store I am drawn to all of the brown transferware collections. 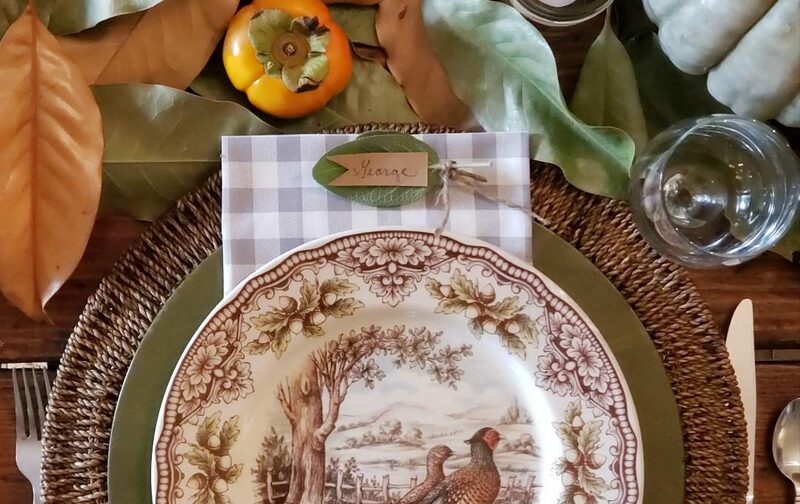 I found a small collection last year with my husband at a darling barn antique shop but it really only was cups, saucers, and dessert plates, no dinner plates at all. But then my mother found this beautiful collection at TJMaxx and picked them up for me. 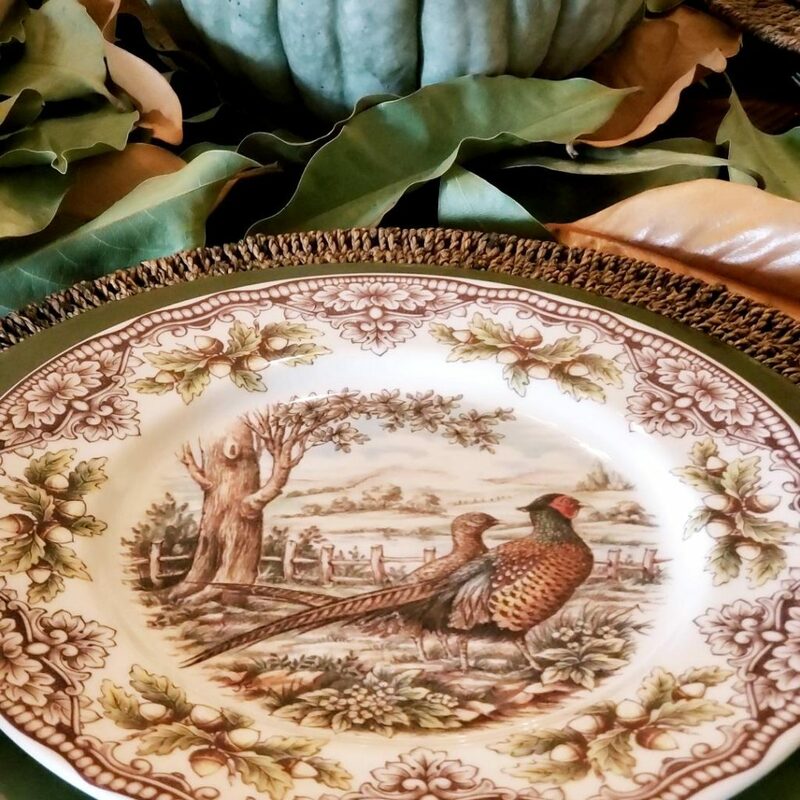 I love the country scene so much too as it really depicts a fall picture so well with it’s acorns and leaves trimmed around two pheasants displaying their relief that they were spared because we are all eating turkey I’m thinking. I have these really pretty basket woven style chargers that my sweet mother in law Jane, who is passed now, gave me years ago. Layered with these these green metal chargers they really make a lovely nest for the new dishes! When choosing cloth napkins I’m so in love with the buffalo check that I knew I had to use that. I made them with fabric from JoAnns, (you can too or here’s a link to get something so similar from Amazon). For some lighting, I just love votive candles in mason jars. 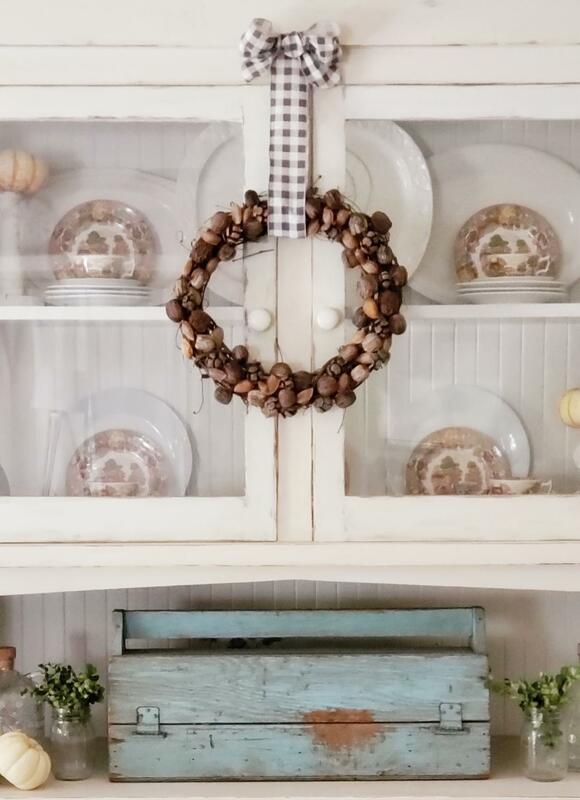 It goes with my simple Rustic Country Farmhouse theme and it keeps everything low so guests can see each other over the tablescape while we gather, eat, and visit. 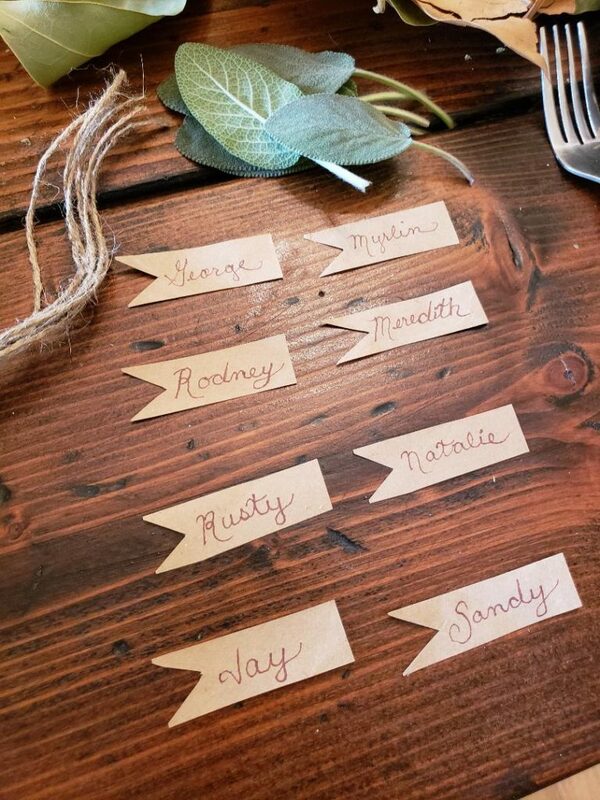 I think place cards are cute and sweet to add to making your guests feel special. It doesn’t have to be a formal, stuffy custom as some might think. As a teacher, I know that when a child here’s their name spoken out loud or sees it in print, they are engaged and feel recognized. We’re all a little bit of a child at heart, so why not make the extra effort for everyone to feel that way. 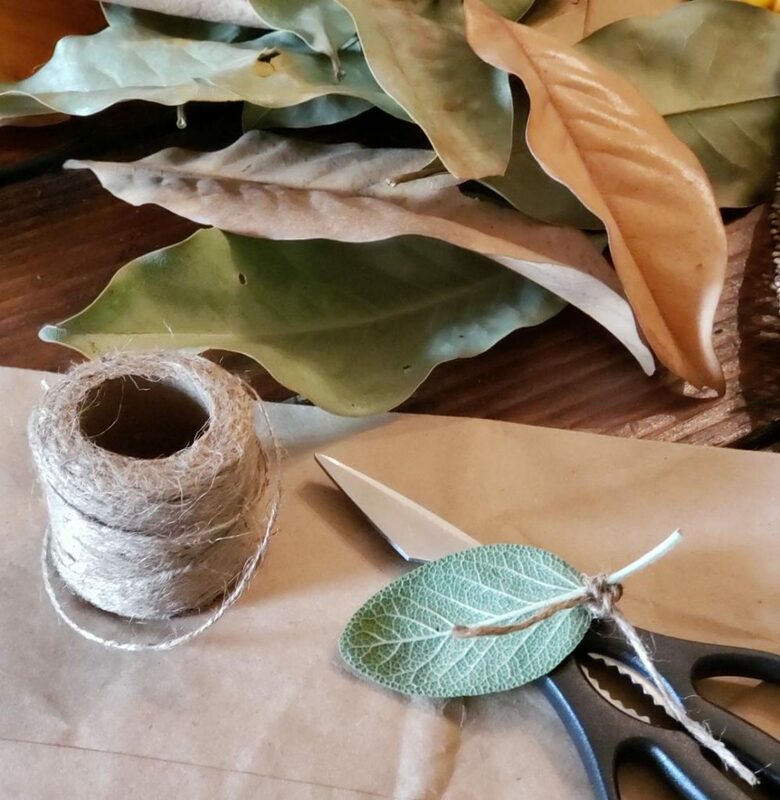 My simple sage leaf from my garden with a bit jute twine and brown paper bag strips with names written in cursive fits perfectly with my rustic garden look. The sage leaves smell so good too! 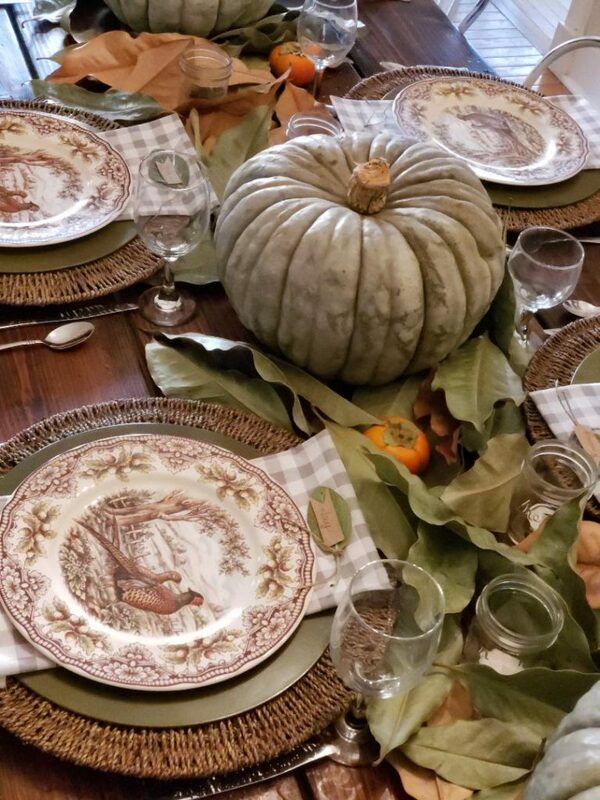 Then my sweet friend Jean generously offered her persimmons from her tree that I added to my table decor which I scattered about. 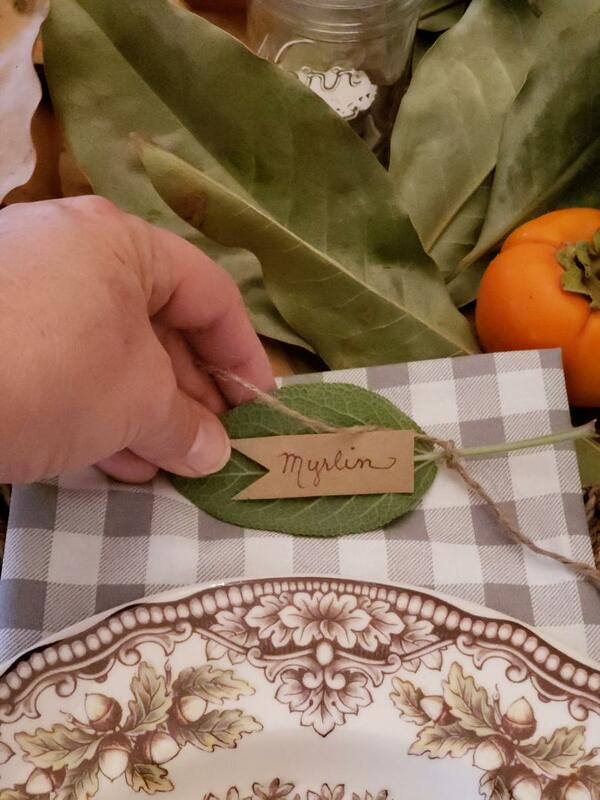 The leaf place cards were put above the plate, set on the cloth napkin so everyone could see the pretty transferware plates. It’s fun at times to continue with the layer look and set napkins with place cards right on top of plates, but these plates are so stinkin’ cute, there’s no way I wanted to cover them up. Aw, what a pretty table! 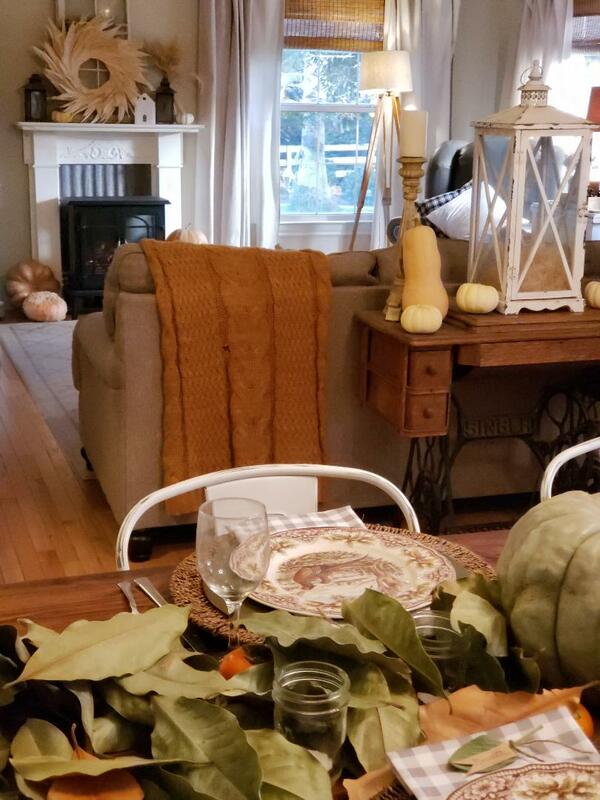 I’m so happy with how it all looks and I hope our guests will feel welcome, special, and ready to eat and celebrate. Happy almost Thanksgiving and many blessings to you my sweet friend! I hope you are enjoying this weekend before the fun of feasting and gathering begin. What a lovely setting. 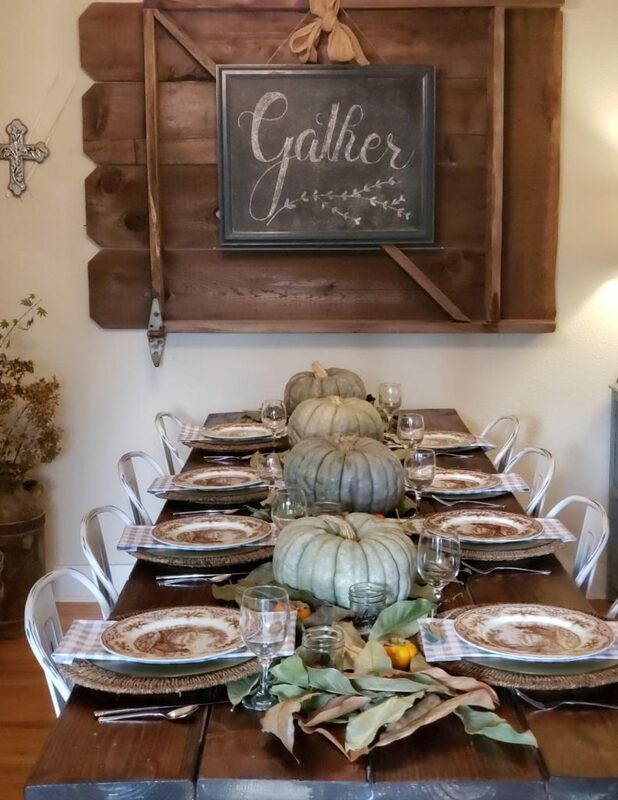 I too like Thanksgiving because it is about gathering to give thanks to our Lord. Thank you so much Pat! Yes, isn’t Thanksgiving great! So simply wonderful! Oh Jerri! It’s so inviting and welcoming, and I just loved your “definition” of the word gather- heart warming! Thank you sweet sister angel! I love and appreciate you! This table is so pretty. Love the coloring and the idea of the name cards. Everything looks so good together. I am sure everyone is going to have a special time sitting around this table. 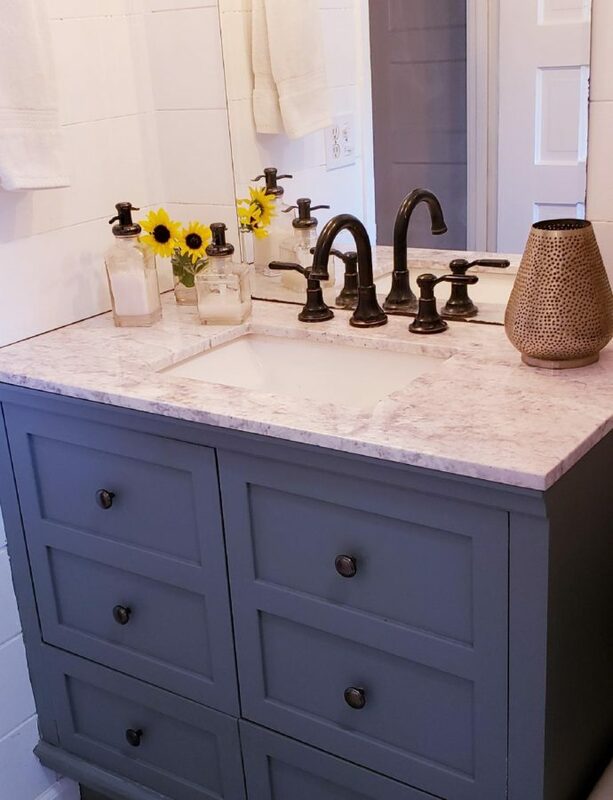 So many wonderful, rustic touches here. 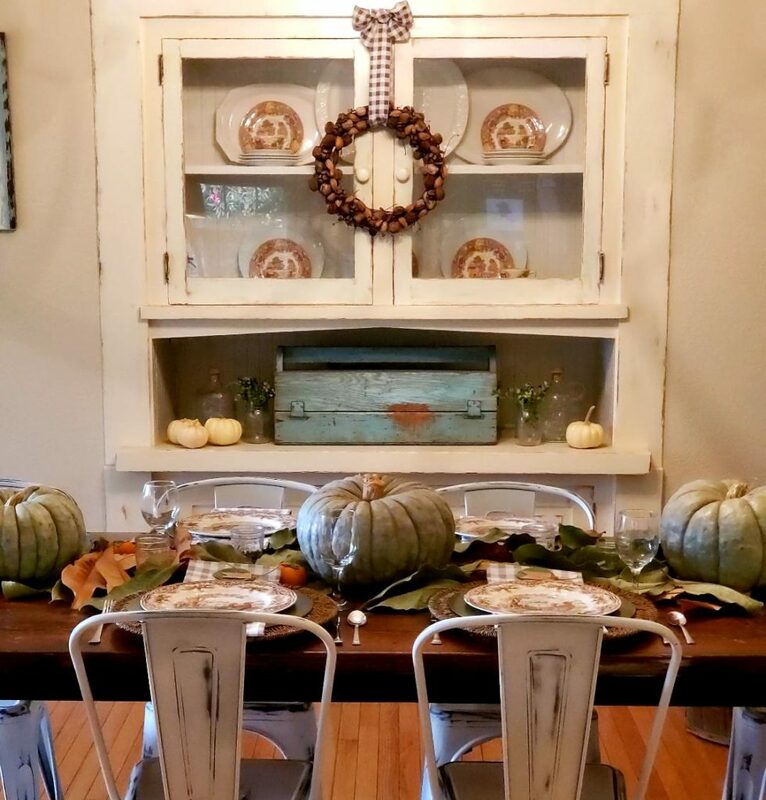 Thanks for sharing how you put this pretty table and dining room together. Thank you Susan! So, so sweet of you! Ahhhh! It turned out so pretty! I noticed the beautiful plates right away. Love them! Sweet comments about using names. I agree, and the simple name cards are just perfect. Gotta love that sweet Mama of mine, she picked out such cute plates.